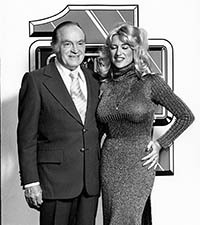 SEMA Hall of Fame - Linda Vaughn, 1985, Hurst Performance Products. 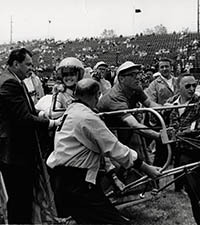 Linda is “The First Lady of Auto Racing,” one of the most famous personalities in all of motorsports. 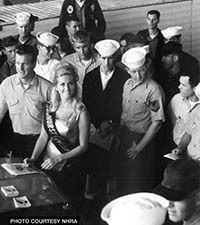 She began her career as a beauty queen in 1961; the following year she was named Miss Pontiac, followed by Miss Atlanta Raceway and Hurst Golden Shifter Girl. Linda also held the position of vice president of public relations for Hurst. She is repeatedly recognized for her volunteer service to industry causes. As a founding member of the SEMA SBN Council, she received its Lifetime Achievement Award. In 1988, SEMA honored her achievements with a special citation during the Salute to the American Automotive Performance & Motorsports Industry program in Washington, D.C. She was elected to the Drag Racing Hall of Fame and was named a SEMA Person of the Year. Linda also received her competition driver’s license from the SCCA.